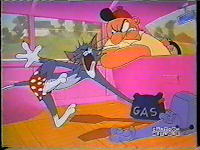 Once the amazing H-B Tom and Jerry cartoons came to an end, the series was placed in the hands of Gene Deitch. To say that the films took a bizarre turn would be an understatement. Watching these cartoons is like watching an eerie T&J nightmare. 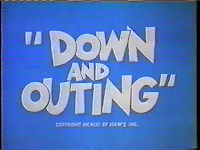 "Down and Outing" sounds like it would be typical fare for H-B (Tom goes fishing with his owner and Jerry tags along), but in the hands of Deitch, who had never seen a Tom and Jerry cartoon before taking over the series, the situation becomes creepy. 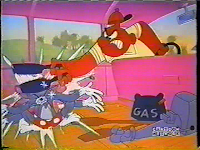 Shaky animation, off-model characters and a tin-like soundtrack all contribute to the cartoon's lackluster quality. Am I being too harsh? Possibly since I am comparing the films to what had come before, and let's face it, there is no comparison. Anyway, Tom is abused severly by his owner, even though some might say the cat brings it upon himself. After a hellish car ride to the lake, we are now ready for some fishng-type shenanigans. However, we never really get any. 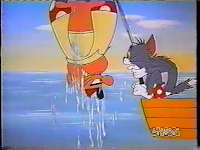 The potential for such a set-up never pays off as Tom's owner opts to fish with Jerry while Tom is bound with rope in the boat. Well, it seems this blog is a year old today. I just wanted to take a moment to thank those of you who stop by here. I do appreciate it. Again, I am sorry for the lack of updates but life is busy. 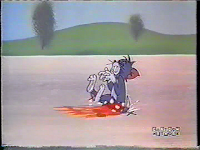 Feel free to leave some comments as it might jump-start me into digging through my vhs tapes in order to continue with the Tom and Jerry tribute. Maybe I can actually finish it by the next anniversary. I'll get to work on that, but I couldn't let one year and 10,000 visitors go by without saying thanks. Peace!